The "Brownhills Hoard" was discovered by amateur metal detector Terry Herbert in a field belonging to a farmer Fred Johnson, near Brownhills on the 5th July 2009. 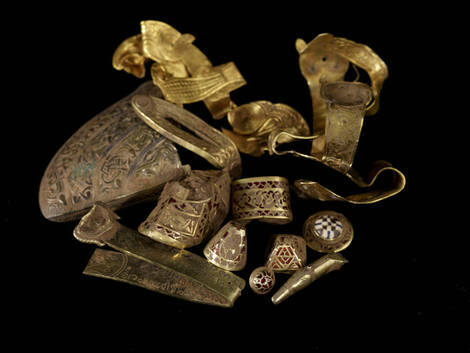 His find turned out to be the largest Anglo-Saxon hoard of gold ever found in the country - over 1,500 items - about 11lb of gold and 3 lb of silver. The artefacts of the Mercian Kingdom of 7th or 8th Century has been declared treasure and so belong to The Crown. The hoard is valued at over £3 million which will be shared between the finder and the landowner. The site of the Gold Hoard is currently marked by a beacon used on Monday 4th. of June 2012 to celebrate the Diamond Jubilee of Queen Elizabeth II. 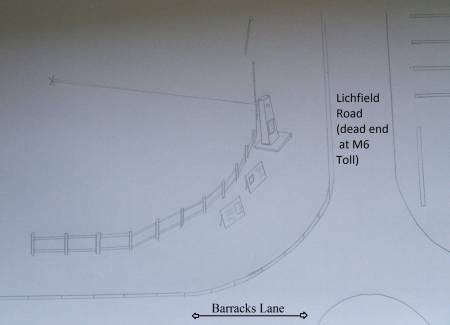 The PRIVATE site of the hoard is bounded by Watling Street (A5), Barracks Lane and Lichfield Road (part closed). 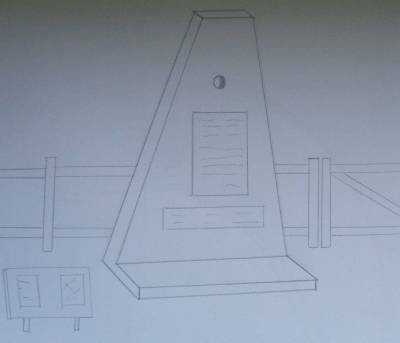 The beacon is not expected to remain at the site, so a lasting memorial (like the one detailed below) would be a great asset to Brownhills. Since it was found, several suggestions have been put forward about preserving the site. Fred [The landowner and farmer] is adamant he wants nothing on the land. Some local councillors are talking about a visitors centre similar to the one at Sutton Hoo. In the present climate I think that is a non-starter so Ive tried to come up with a cheap version for now. Last year I asked Fred if we could put a cairn of some sort on the site. He said no. I asked if we could erect a post or flagpole or something. He said it would hinder him when he comes to plough in a couple of years time. Then I thought of the stones at Carsington Water, and he agreed with that as it wouldnt be on his land. My worry is that in a few years time, the land will get ploughed over, hedges or boundaries moved and if we dont do something in 20 years time nobody will remember where the hell the site was. Also if Fred passes on and his nephews sell the land, whos to say in years to come we couldnt have a housing estate or retail park there. Unlikely I know, but when I was kid, Clayhanger Lane was green belt and no one could build there, we were constantly told. Now look at it. I just feel that Brownhills should just hang on to something, despite the apathy of the big Bird and his lot. I have made an amateurish attempt to clarify my idea and I hope you can grasp the idea. The hole through the centre of the plinth would focus on the centre of the site. Information plaques and pictures could be put on the plinth or extra hoardings. The whole road stub could be cleaned up and a small car park incorporated. "The Brownhills Hoard" / "The Anglo-Saxon Hoard" / "The Staffordshire Hoard" / The "Lichfield Hoard" ---- The find is a few yards within the current Staffordshire border - The find is nearer to Brownhills than any other community - Brownhills is administered by Walsall Metropolitan Borough Council within the West Midlands County area (but was part of Staffordshire before 1974) - Brownhills did not exist in the 7th or 8th Century but Ogley Hay may well have - Lichfield may have been the nearest large community in the 7th or 8th Century. So, what should the find be called and where should it be displayed? I would be in favour of the Hoard being held permanently near to Brownhills which is administered by Walsall Metropolitan Borough Council. Walsall has The Museum & Library and the New Art Gallery - so why not in Walsall? Robert Johnson (who is in favour of the Hoard staying in Walsall) has written this poem in celebration of the "Brown Hill Hoard"
now Hell possessed, fell breathe-choked at the Brown Hill. is slipped under the forest floor, out of harms way. Safe in the earths keeping, the hard won scrap-gold rests. the crumpled cross of the Wielder of Glory; and Beasts of The Book. War-gear wrought with skill: sword-fixings; hilts; cheek-pieces; arm-bands. The finest war-trappings of the finest men, battle-fallen and gone. scrap-finder of renown, following the ploughman, a son of John. Around his Feast Day he tilled the treasure, unlocked the hoard. Now all hail the ancient and forgotten sword-heroes of middle earth. Option 1 - a purpose built museum at the site of the find. Option 2 - a purpose built museum in the town of Brownhills. Option 3 - use or expand the existing facilities at Walsall. Option 4 - display in Wednesbury/Wednesfield/Willenhall due to their strong Anglo-Saxon connections. 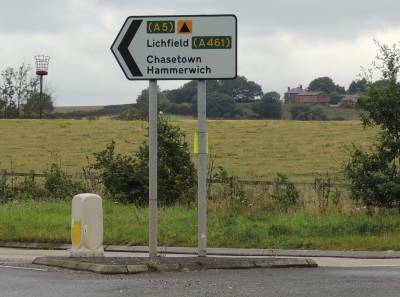 Option 5 - display in Tamworth as a past capital of Mercia. Option 6 - form a Birmingham/Stoke-on-Trent/Lichfield consortium to share the find. Option 7 - display at the British Museum as part of a national collection. Option 8 - form a touring collection to travel the nation and the world. Option 10 - sell off the Hoard to the highest bidder. Option 11 - sell off the Hoard piece by piece to the highest bidders. Are there any other options to add to the list? "The hoard consists of more than 1,500 items. The contents include finely worked silver and gold sword decorations removed from weaponry, including 66 gold sword hilt collars and many gold hilt plates, some with inlays of cloisonné garnet in zoomorphic designs. The Staffordshire Hoard official press statement notes that the only items in the hoard that are obviously non-martial are two (or possibly three) crosses. The largest of the three crosses is missing some decorative settings (yet some are present but detached) but otherwise remains intact, and it may have been an altar or processional cross. Yet the cross is folded; either prior to burial "to make it fit into a small space" or as a sign that the burial deposit was made by pagans. On the other hand, the statement notes, "Christians were also quite capable of despoiling each other's shrines." One of the objects is a small strip of gold inscribed on both sides with a quotation from the Old Testament in Latin: SURGE DNE DISEPENTUR INIMICI TUI ET FUGENT QUI ODERUNT TE A FACIE TUA ("Surge Domine et dissipentur inimici tui et fugiant qui oderunt te a facie tua"), which translates as: "Rise up, Lord; may Your enemies be scattered and those who hate You be driven from Your face." Michelle Brown, Professor of Medieval Manuscripts Studies in London, believes that, based on the use of uncial letter forms, the style of lettering used implies a date of 7th or early 8th century, whereas Professor Elisabeth Okasha of University College Cork, an expert on early medieval inscriptions, has identified traits in the insular majuscule script that are similar to later inscriptions datable to the 8th or early 9th century. Most of the other treasures unearthed in the hoard appear to be military-related and the strip may have been fastened originally to a shield or a sword belt. There are no domestic objects, such as vessels or eating utensils, or feminine jewellery, which are the more common Anglo-Saxon gold finds, and reportedly, the contents "show every sign of being carefully selected". " Mercia was the last Anglo-Saxon kingdom to be created, and was thus bordered on most sides by other such realms; to the north lay the Anglian kingdom of Northumbria, separated by the River Humber and the Derbyshire uplands; to the east in Norfolk and the Fens was the kingdom of East Anglia; while to the south lay the Saxon kingdoms of Essex in the south-east, Sussex in the south, and Wessex in the south-west. The founder of the kingdom was the warlord Cryda (Cridda), the mightiest of several Anglic noblemen, who first moved into the Midland area sometime during the year A.D.586. Cridda called his newly-formed kingdom Mercia, which is a Saxon compound name from the words Merc 'a mark or boundary line', and -ric 'a rule or kingdom'; Mercria then, was 'The Kingdom at the Borders'. The name very likely refers to the fact that the kingdom's western borders abutted against the Welsh foothills, the last bastion of the ancient Britons, into which the remnants of the Romano-British peoples had been beaten by the Anglo-Saxon war-bands of Cridda and his like." All of these took place within sight of the Hoard - if any of them had taken place a little to the side would the Hoard have been discovered earlier or lost forever?